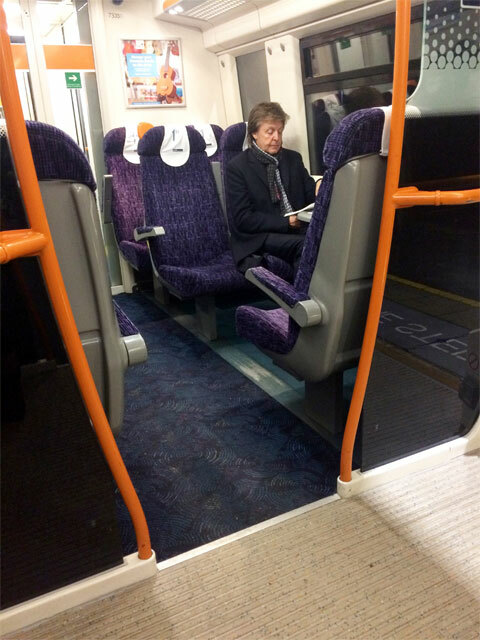 The famous Beatle was spotted travelling from Kings Cross to Hastings. He may be one of the most famous musicians from the most iconic band in history, but Paul McCartney was caught riding the train like an average joe this week. According to the Daily Mail, Beatles star was travelling on his own on a train from Kings Cross to Hastings and was happy to talk to fans, although he wasn't posing for photos. A passer-by told the outlet: "He was on his own without any bodyguards or staff. "Only a few people stopped to say hello and that it was nice to see him," the city-worker revealed, before continuing: "He didn't want photos but he was very polite and happy to chat, taking about a new album he has coming out". The Daily Mail adds that the Ticket To Ride star was using an old-school Nokia phone. McCartney recently said that collaborating with with Kanye West was like working with The Beatles. He revealed he had “doubts” about working with the rapper… but found there was a bit of a “Sgt Pepper” vibe to the way the US star worked. In a Facebook Live chat with comedian and musician Tim Minchin, the Beatle said that he was nervous about the 2015 collaboration with the hip hop star, titled FourFiveSeconds, which also included Rihanna. Macca explained: "I got a phone call and my manager said, Kanye West would like to work with you. And I go, Yeah, we'll do it. “I was a little bit nervous at first, because I thought it could go horribly wrong. But I was intrigued to see what he was up to and how he did it. And it was a very intriguing process. "You basically don't write songs. You basically just talk and noodle a bit and you record it all on your phone. And then he goes away. And that's basically his record. But it was great doing it because I don't work like that." McCartney was talking to Minchin as he announced his first Australian and New Zealand dates in 24 years.